Alan Alda as Hawkeye and Richard Ely as George in M*A*S*H.
Before it was allowed for soldiers to be openly gay in the military, they would be dishonorably discharged if they were found out. In light of this, the television series M*A*S*H aired an episode call "George" on February 16, 1974. It was the 22nd episode of the show's second season. Among the latest batch of wounded soldiers treated at the 4077th is a young soldier, Private George Weston (Richard Ely), who is also heavily bruised in addition to the leg wound he received in battle. 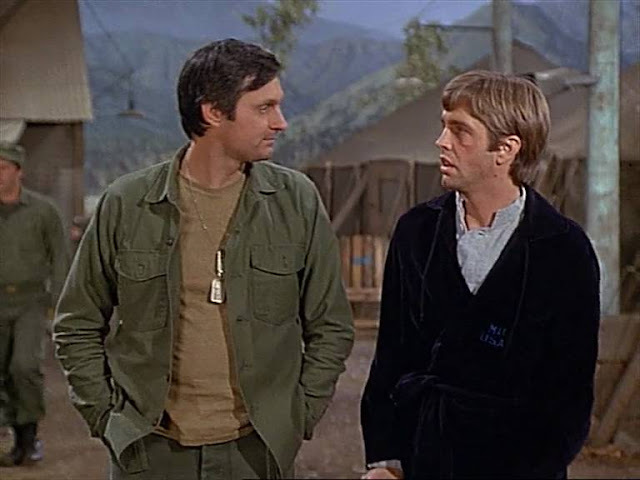 After brushing off Frank Burns' (Larry Linville) suggestions he had been involved in a fight, Weston confides to Hawkeye (Alan Alda) that he had been beaten up by soldiers from his unit after he inadvertently admitted to being a homosexual. Back in the Swamp, Hawkeye and Trapper (Wayne Rogers) discuss the beatings and Frank admits he finds Weston's sexuality "disgusting," in contrast to his initial admiration of Weston for being on frontline active service. Frank initiates moves to have Weston dishonorably discharged from the Army. In order to convince Frank not to proceed, Hawkeye and Trapper stage a mock argument, during which Trapper 'confesses' to having bought the answers for a medical school examination, which leads Frank to admit that he did, too. Hawkeye and Trapper admit their ruse and Frank is persuaded to drop his actions. Writing at a time when openly gay people were prohibited from serving in the United States armed forces, gay television historian Stephen Tropiano notes the continued relevance of "George" because it "expos[es] the ignorance behind the discrimination of homosexuals in the military." He notes that, unlike other gay-themed episodes of the era, "George" does not make its gay character the target of jokes except from the bigoted Frank Burns.